Background: The endophytic fungi are an excellent source of secondary metabolites as a natural product with antimicrobial, insecticidal, cytotoxic, antioxidant, and anticancer activities. No studies on the chemical compounds of the endophytes of Mikania laevigata have been described in the literature. 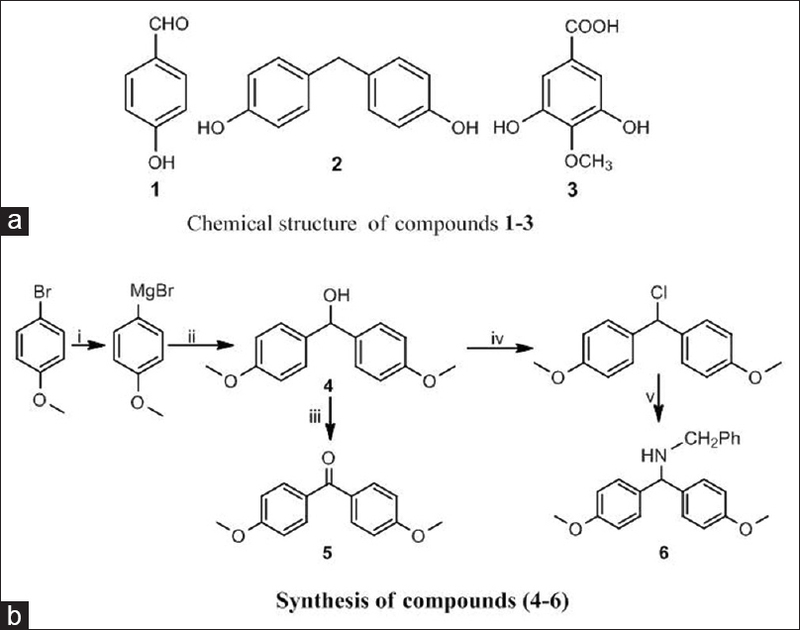 Objective: The objective of the study is to investigate by reversed phase high-performance liquid chromatography coupled with mass spectrometric multistage (RP-HPLC-MS/MS) the secondary metabolites of the endophytic fungi Nodulisporium sp., isolated from the medicinal plant M. laevigata (Asteraceae). Materials and Methods: The mycelia biomass strains of Nodulisporium sp. were accumulated and separated from the aqueous medium by filtration; the filtrate was subjected to a liquid–liquid partition with ethyl acetate (EtOAc) resulting in the crude EtOAc extract. This extract was analyzed by RP-HPLC-MS/MS. Results: The total mass chromatogram of the EtOAc crude strain Nodulisporium sp. extract showed compounds eluted between 13 and 20 min. The peak 1 (Rt 13.8 min), peak 2 (Rt. 14.8 min), peak 3 (Rt. 15.7 min) and peak 4 (Rt. 19.6 min) were characterized as dechlorogriseofulvin (C17H18O6), griseofulvin (C17H17O6Cl), cytochalasin D (C30H37NO6) and nodulisporic acid B2 (C43H57NO7), respectively. Conclusion: The present work provides the first scientific report on constituents of endophytic fungi Nodulisporium sp. isolated from the M. laevigata (Asteraceae). Abbreviations used: EtOAc: Ethyl acetate; RP-HPLC-MS/MS: Reversed-Phase High-Performance Liquid Chromatography coupled with mass spectrometric multistage; CCMB: Culture collection of microorganisms from Bahia; Rt: Retention time. Background: There is limited data about the anti-breast cancer activity of noni fruit ethanolic extract. Topical route is gaining interest as an alternative route for breast cancer treatment. Objectives: The aims of this study were to investigate the effect of noni fruit extract on cytotoxicity and cell migration suppression in Michigan Cancer Foundation-7 (MCF-7) human breast cancer cells and to develop topical microemulsions (MEs). Materials and Methods: The noni fruit ethanolic extract was prepared. Rutin content, a marker, in the extract was analyzed, and the antioxidant activity of the extract was determined. Cytotoxicity and cell migration suppression, indicating anti-breast cancer activity, were also assessed in MCF-7 cells by SRB assay and wound-healing assay. The MEs were developed by titration method. The developed noni MEs were evaluated regarding their physical appearance, viscosity, and pH before and after stability test. Results: Results showed that the rutin content in the noni extract was 4.02 ± 0.34 mg/g. The extract possessed antioxidant activity with inhibitory concentration (IC50) of 1.03 ± 0.01 mg/ml. 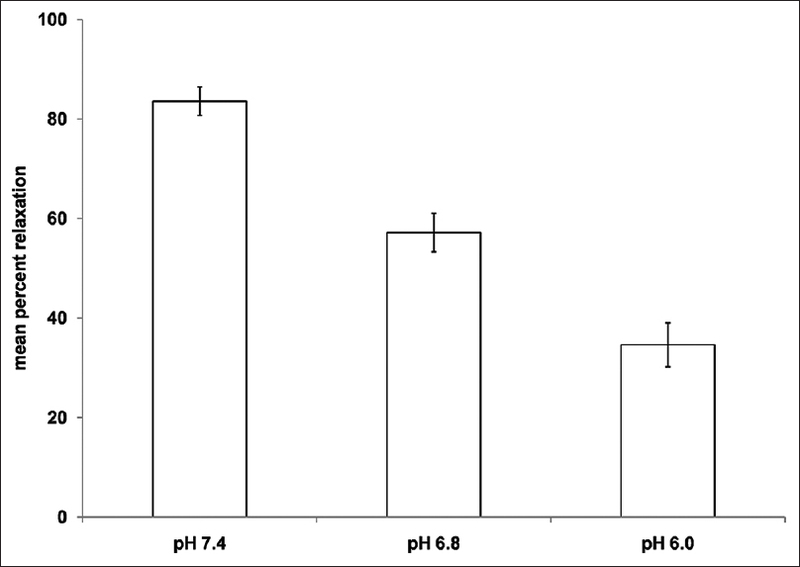 It also showed cytotoxicity with IC50 values of 158.4 ± 12.5 μg/ml and cell migration suppression on MCF-7 cells with significant effect at 100 μg/ml. Eight ME systems were selected to incorporate the extract. Conclusion: Noni extract had potential anti-breast cancer activity. The ME, named noni ME-3, consisting of 0.7% w/w noni extract, 56% w/w olive oil, 20% w/w polysorbate 80, 20% w/w sorbitan oleate, and 4% w/w water phase, was shown to be the most attractive noni ME for the topical treatment of breast cancer. Abbreviations used: HPLC: High-performance liquid chromatography; SRB: Sulforhodamine B assay; RT: Room temperature. Background: The aim is to study the central nervous system (CNS) depressant, anxiolytic, and antiepileptic activities of methanolic extract of Clerodendrum viscosum (MECV) leaves. Materials and Methods: The study comprised five groups each with 6 Wistar albino rats. 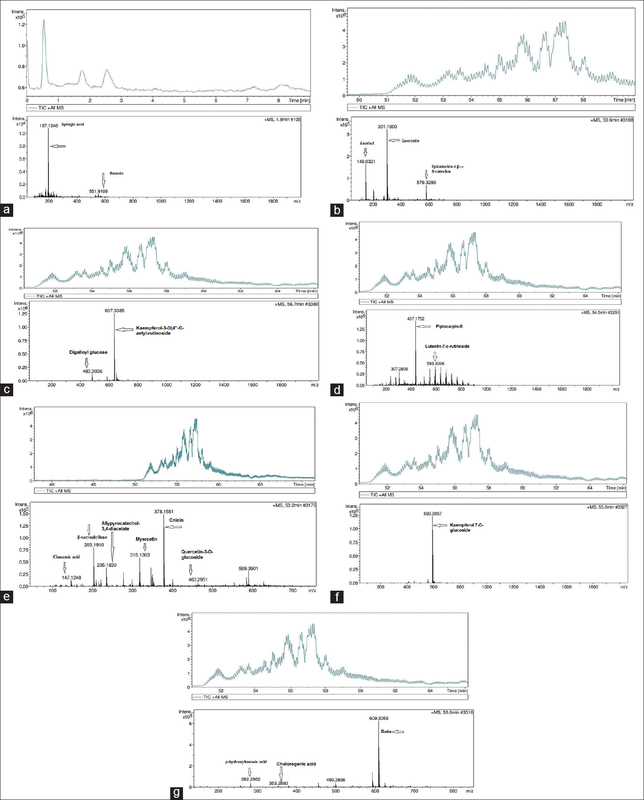 The Group 1 or the positive control (phenytoin 30 mg/kg for the epilepsy model, and diazepam 1 mg/kg for the other models), Group 2 or negative control (0.9% NaCl at 10 ml/kg), and Groups 3–5 or the test drug group (MECV at 200, 400, and 800 mg/kg). Actophotometer test, staircase test, maximal electroshock seizure (MES) test, and the thiopentone sodium-induced sleep test, were used to study the various parameters. Results: The actophotometer test, MES, and staircase test (steps climbed) were analyzed using parametric tests. The sleep induction and staircase test (number of rears) were evaluated using nonparametric tests. A dose-dependent significant (P < 0.05) response was observed in the actophotometer test, sleep induction, and MES tests in comparison to control. In the staircase test at 200 and 400 mg/kg, increase in the number of steps climbed, and at 800 mg/kg decrease in both the number of steps climbed and rears were observed in comparison to control. Conclusion: MECV showed a dose-dependent CNS depressant action in the sleep induction and antiepileptic tests. 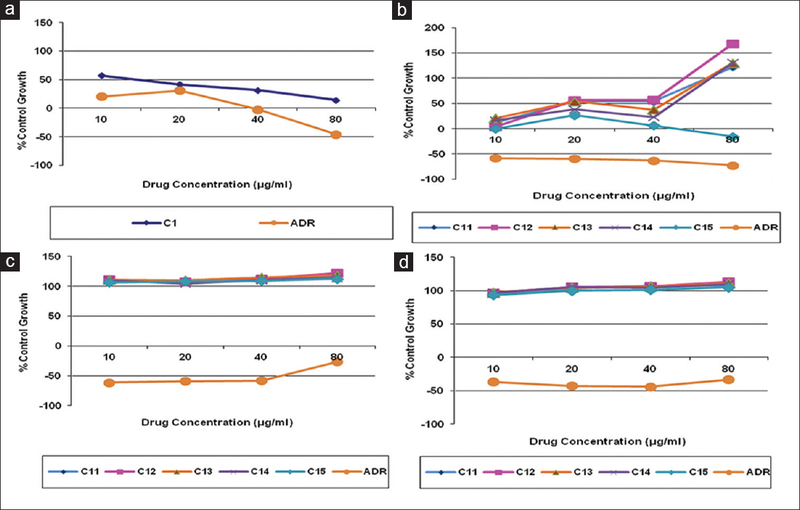 A CNS stimulant action was observed at low dose (200 mg/kg) and depressant action at a higher dose (800 mg/kg) in the staircase test in comparison to control. Abbreviations used: GLP: Good laboratory practice; CPCSEA: Committee for the Purpose of Control and Supervision of Experiments on Animals; IAEC: Institutional Animal Ethical Committee; CNS: Central nervous system; BZDs: Benzodiazepines; IP: Intraperitoneal ANOVA: Analysis of variance; MECV: Clerodendrum viscosum; HLE: Hind limb extension; HLF: Hind limb flexion; NMDA: N-methyl-D-aspartate; MES: Maximal electroshock seizures; MECV: Methanolic extract of Clerodendrum viscosum; GABA: Gamma-Aminobutyric acid; CCK: Cholecystokinin; PME: Pseudospondias microcarpa; ECG: Electrocardiography; REM: Rapid eye movement; NREM: Nonrapid eye movement. Background: Epilepsy is a chronic neurological disorder occurred due to periodic neuronal discharge and imbalance in brain electrical activity. 4-Hydroxy-TEMPO (Tempol) is a membrane-permeable radical scavenger moiety. Aim: The aim of this study is to evaluate the anticonvulsant potential of tempol against pentylenetetrazol (PTZ)-induced seizures in mice. Materials and Methods: Convulsion was produced in the male Swiss albino mice by administration of PTZ (90 mg/kg, i.p.). Mice were pretreated with either vehicle, tempol (50, 100 and 200 mg/kg, i.p.) or diazepam (5 mg/kg). Various behavioral, biochemical, molecular, and histological parameters were evaluated. Results: Mice pretreated with tempol (100 and 200 mg/kg) showed significantly (P < 0.01 and P < 0.001) delayed-onset on tonic-clonic convulsion, decrease the duration of convulsions and mortality in mice. Intraperitoneal administration of PTZ resulted in significant increase in oxido-nitrosative stress, whereas it significantly (P < 0.01 and P < 0.001) inhibited by the tempol administration. There was significant increased (P < 0.01 and P < 0.001) in the levels of brain monoamines (gamma-aminobutyric acid [GABA] and dopamine) and Na+ K+ ATPase activity, whereas significant decreased (P < 0.01 and P < 0.001) in xanthine oxidase activity in tempol pretreated mice. PTZ-induced up-regulated mRNA expressions of tumor necrosis factor-alpha, interleukin-1 beta , and c-Fos were significantly inhibited (P < 0.01 and P < 0.001) by tempol. It is also significantly down-regulated (P < 0.05 and P < 0.001) immunohistochemical c-Fos expressions. Conclusion: Pretreatment with tempol attenuates PTZ-induced tonic-clonic seizures via its anti-inflammatory, anti-oxidant and GABAergic potential. Abbreviations used: GABA: Gamma-aminobutyric acid; PTZ: Pentylenetetrazol; TNF-α: Tumor necrosis factor-alpha; 4-HT: 4-Hydroxy-TEMPO; DZP: Diazepam; GSH: Reduced glutathione; NO: Nitric oxide; MDA: Malondialdehyde; SOD: Superoxide dismutase; ROS: Reactive oxygen species; IL-1β: Interleukin-1 beta. Background: Naturally available extracts have gained importance as adjunctive pharmacologic modalities. The earthworm coelomic fluid (ECF) has shown promising in vitro cytotoxic effect in hepatocellular, colorectal, and breast cancers. Few in vitro studies have been performed pertaining to oral cancer. Objective: The objective of this study was to evaluate the time- and dose-dependent antiproliferative effect of ECF of Eudrilus eugeniae (EE), Eisenia fetida (EF), and Perionyx excavatus (PE) on oral cancer cell line KB 3–1. The chemical nature of the ECF was analyzed as well. Materials and Methods: The ECF was collected employing the cold shock method. Lowry's protein estimation was used for determining the total protein content. ECF of EE, EF, and PE at concentration of 6.25, 12.5, 25, and 50 μg/mL was tested on KB 3–1 cells in vitro. The 3-(4, 5-dimethylthiazol-2-Yl)-2, 5-diphenyltetrazolium bromide antiproliferative assay was used to determine the time- and dose-dependent antiproliferative effect. Sodium dodecyl sulfate-polyacrylamide gel electrophoresis was performed to separate and observe prominent protein bands in the three extracted fluids. The chemical nature of the band was analyzed through an enzyme zymography. Results: ECF of PE showed a maximum inhibitory percentage of 94.29% at 50 μg/mL, followed by ECF of EE and EF with values of 89.23% and 79.44%, respectively. ECF of EE showed a superior IC50 value of 3.70 μg/mL as compared to EF and PE at 48 h. Conclusion: ECF of EE has a promising antiproliferative effect in a time- and dose-dependent manner on oral squamous carcinoma KB 3–1 cells in vitro. The serine protease presence in ECF of EE was demonstrated. Abbreviations used: EFE: Earthworm fibrinolytic enzyme; BSA: Bovine serum albumin; DMSO: Dimethyl sulphoxide; ECF: Earthworm coelomic fluid; EE: Eudrilus eugeniae; EF: Eisenia fetida; PE: Perionyx excavatus; ELISA: Enzyme-linked immunosorbent assay; FBS: Fetal bovine serum; IC: Inhibitory concentration; MEM: Minimal essential medium; MTT: 3-(4, 5-dimethylthiazol-2-Yl)-2, 5-diphenyltetrazolium bromide; NCCS: National Centre for Cell Science; NCI: National Cancer Institute; OD: Optical density; PBS: Phosphate-buffered saline; SDS-PAGE: Sodium dodecyl sulfate-polyacrylamide gel electrophoresis; TEMED: Tetramethylethylenediamine. Background: Arunachal Pradesh the north-eastern state of India is a natural habitat of 550 species of orchids including 37 species of medicinal importance. Although these plants are regularly used by ethnic population, very few scientific investigations have been conducted to establish their pharmacological potential. In our previous study, we evaluated antimycobacterial and leishmanicidal activity of extracts prepared from three relatively unexplored medicinal orchids. In the present study, we conducted screening of the compounds isolated from Tropidia curculioides (Tc) for the above-mentioned activities. Furthermore, we prepared synthetic analogs of the most active compound. Objective: Evaluation of antimycobacterial and leishmanicidal activity of the isolated compounds and preparation of synthetic analogs of the most active compound followed by evaluation of biological activities. Materials and Methods: Antimycobacterial activity was evaluated by colorimetric redox indicator assay, and the leishmanicidal activity was assessed by 3-(4,5-dimethylthiazol-2-Yl)-2,5-diphenyltetrazolium bromide assay. The root, stem, and leaves of Tc were extracted with methanol:water (9:1) followed by fractionation with diethyl ether (Et2O) and n-butanol solvent. All these fractions were evaluated for biological activity to identify the most active fraction. 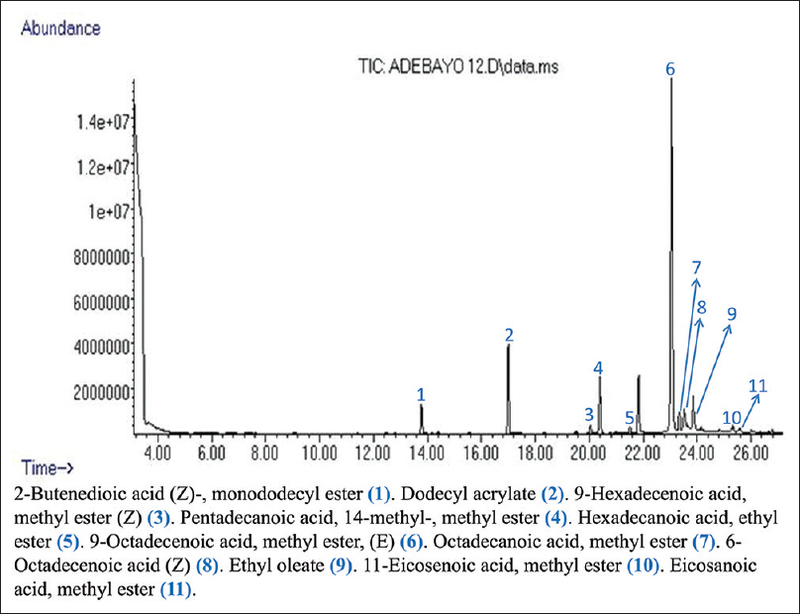 Further, chromatography of the most active fraction (Tc root Et2O fraction) afforded three compounds, namely, 4-hydroxybenzaldehyde (1), 4,4'-dihydroxydiphenylmethane (2), and 3,5-dihydroxy-4-methoxybenzoic acid (3). Standard synthetic procedures were followed to prepare the analogs of the most active compound. Results: The screening result identified compound 2 with maximum antimycobacterial activity (minimum inhibitory concentration [MIC] – 125 μg/ml) and leishmanicidal activity (IC50 100 μg/ml). Three synthetic analogs were prepared targeting the methane linkage of compound 2. The N-benzylmethylamine derivative (6) showed the highest activity with MIC 15.62 μg/ml against Mycobacterium and IC50 31.25 μg/ml against Leishmania spp. Conclusion: The promising result of N-benzylmethylamine analog could be explored to obtain new antimycobacterial and leishmanicidal agent. Abbreviations used: MIC: Minimum inhibitory concentration; NMR: Nuclear magnetic resonance; CRI: Colorimetric redox indicator; OADC: Oleic acid, dextrose, and catalase; MDR: Multidrug Resistant; MTT: 3-(4,5-dimethylthiazol-2-Yl)-2, 5-diphenyltetrazolium bromide; Diethyl ether: Et2O. Background: Campylandra aurantiaca (Asparagaceae), commonly known as Nakima in Sikkimese Tibetan, is a plant grown in South-Central China and Northeast India. Objective: To evaluate the hypoglycemic activity of ethyl acetate fraction of methanol extract from C. aurantiaca rhizome (EFCA) in high-fat diet (HFD) and low-dose streptozotocin (STZ)-induced diabetic Wistar rats. Materials and Methods: In rats fed with HFD for 4 weeks, hyperglycemia was induced by single intraperitoneal injection of STZ (35 mg/kg body weight). 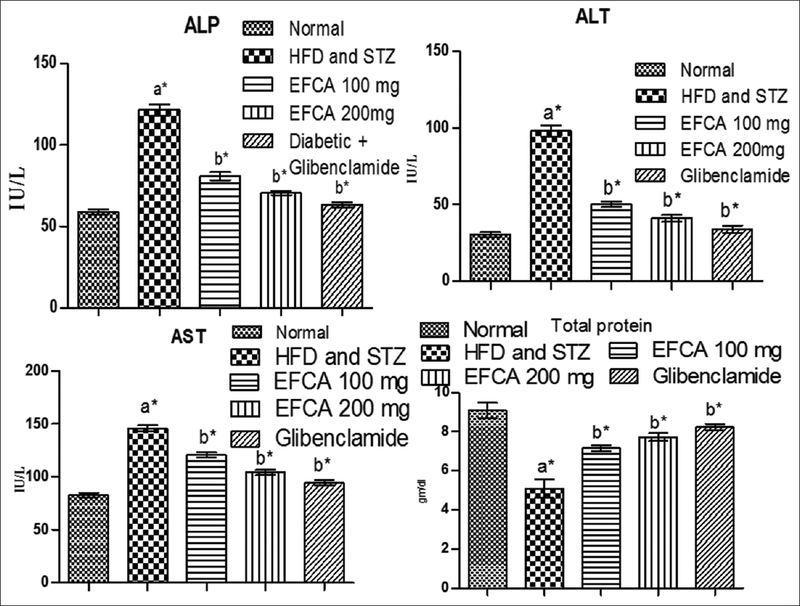 Seven days after STZ induction, the hyperglycemic rats were treated with EFCA orally at the doses of 100 and 200 mg/kg b.w. daily for 28 days. Glibenclamide (0.5 mg/kg, orally) was used as reference drug. The fasting blood glucose levels were measured on every 7th day during the 28 days of treatment. Serum and hepatorenal biochemical parameters were estimated. Histological study of the pancreas was also performed. Results: EFCA at the doses of 100 and 200 mg/kg orally significantly (P < 0.05) and dose dependently reduced and normalized blood glucose levels as compared to that of STZ control group. Serum and hepatorenal parameters were significantly (P < 0.05) restored toward normal levels in EFCA-treated rats as compared to HFD-STZ control animals. Conclusion: The present study concludes that C. aurantiaca rhizome demonstrated promising hypoglycemic action in HFD-STZ-induced diabetic rats. Abbreviations used: IDDM: Insulin-dependent diabetes mellitus, T2DM: Type 2 diabetes mellitus, NIDDM: Noninsulin-dependent diabetes mellitus, T1DM: Type 1 diabetes mellitus, IDF: International Diabetes Federation, STZ: Streptozotocin, EFCA: Ethyl acetate fraction of methanol extract from Campylandra aurantiaca rhizome, OGTT: Oral glucose tolerance test, HFD: High-fat diet, FBG: Fasting blood glucose, HDL: High-density lipoprotein cholesterol, HbA1c: Glycosylated hemoglobin, AST: Aspartate transaminase, ALT: Alanine transaminase, ALP: Alkaline phosphatase, LPO: Lipid peroxidation, GSH: Reduced glutathione, SOD: Superoxide dismutase, CAT: Catalase, SEM: Standard error of mean, ANOVA: Analysis of variance, HPLC: High-performance liquid chromatography. Background: Ludwigia hyssopifolia of family Onagraceae is traditionally used in the treatment of jaundice. There were no reports on the plant for both in vivo and in vitro hepatoprotective studies. 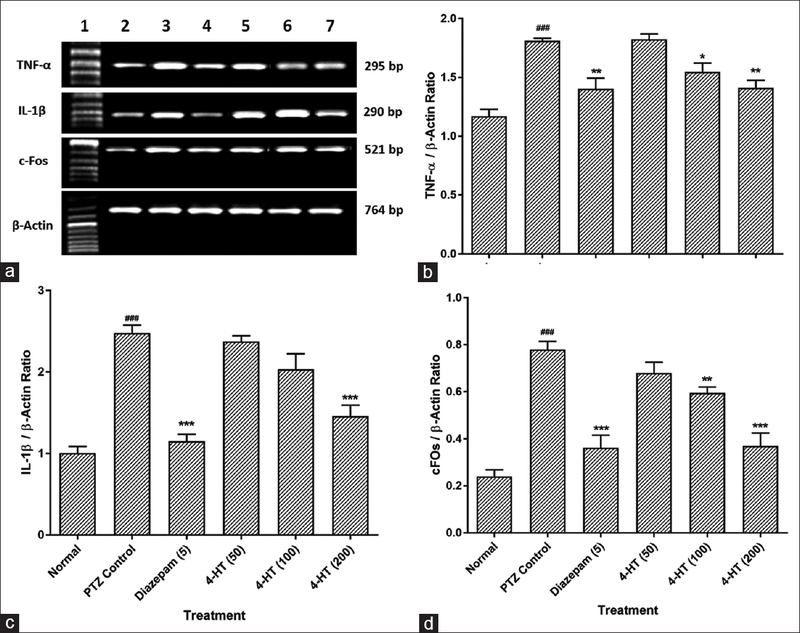 Objective: The current study was aimed to evaluate the methanolic extract of aerial parts of L. hyssopifolia (LHME) for its in vitro and in vivo hepatoprotective activity against ethanol-induced oxidative damage in HepG2 cell lines and Wistar rats, respectively, and in vivo hepatoprotective activity against paracetamol and antihepatotoxic activity against D-galactosamine in rats. Materials and Methods: The antioxidant potential of the extract was investigated by employing different in vitro methods. 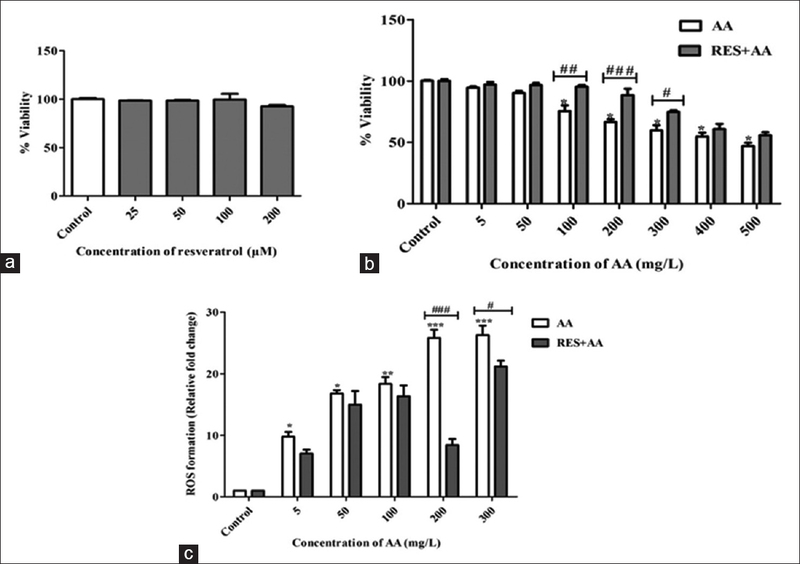 The in vitro hepatoprotective activity of the extract was assessed by estimating cell supernatant for aspartate aminotransferase (AST), Alanine aminotransferase (ALT), and lactate dehydrogenase (LDH) while the in vivo hepatoprotective activity of the extract was assessed on the basis of improvement in the altered level of various serum biochemical parameters and in the changes occurred in the histology of liver of the rats. 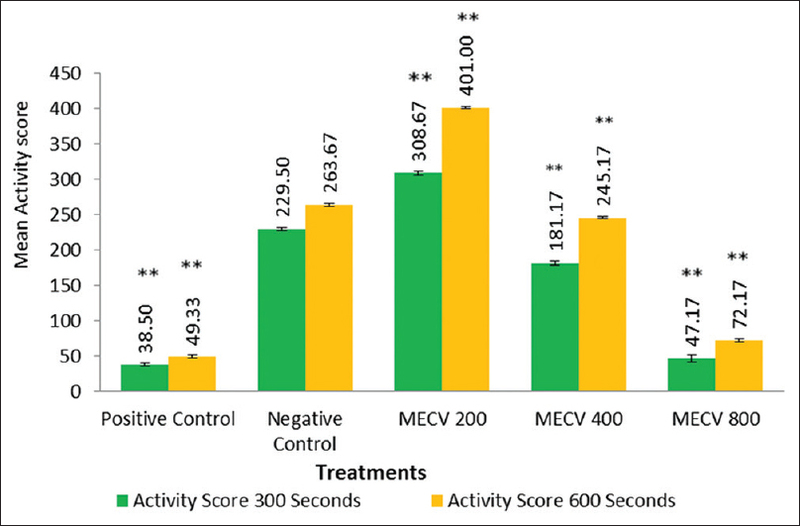 Results: Among the three test doses of LHME, 100 μg/kg and 200 mg/kg were found to be the effective doses in in vitro and in vivo hepatoprotective methods, respectively. 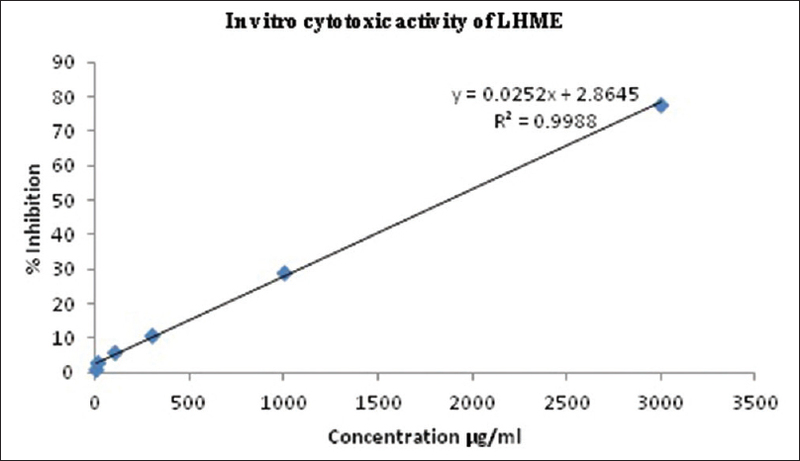 Conclusion: The extract, LHME, exhibited significant (P < 0.01) hepatoprotective activity in both in vitro and in vivo models, which may be attributed to its antioxidant property revealed in both in vitro and in vivo studies. Abbreviation used: DPPH: 1,1 Diphenyl-1-picryl hydrazyl; ALT: Alanine transaminase; ALB: Albumin; ALP: Alkaline phosphatase; AST: Aspartate transaminase; CHOL: Cholesterol; DB: Direct bilirubin; FBS: Fetal bovine serum; GAE: Gallic acid equivalents; GGT: Gamma glutamyl transferase; GLU: Glucose; LDH: Lactate dehydrogenase; MEM: Modified Eagle's Medium; NBT: Nitro blue tetrazolium; PMS: Phenazine methosulphate; RE: Rutin equivalents; LHME: The methanolic extract of Ludwigia hyssopifolia; TBA: Thiobarbituric acid; TB: Total bilirubin; TP: Total protein; TCA: Trichloro acetic acid. Background: Apoptosis is an energy-required programmed cell death process that is vital for normal homeostasis. This is because aged, malfunctioning, and genetically deficient cells such as cancer cells are eliminated through this process to avoid any abnormality in the function of the body system. 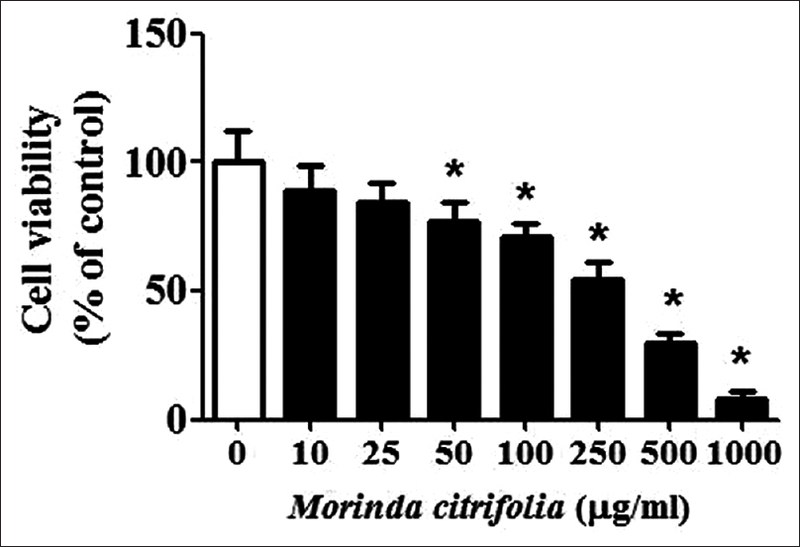 Earlier, we have reported that the Lipophilic hexane fraction of crude ethanolic extract (HF-CEE) of Moringa oleifera seeds inhibited MCF7 breast cancer cell growth. Objectives: The aims of this study are to identify the esters responsible for HF-CEE cytotoxicity and to determine the ability of the compound to trigger Bax and p53 apoptotic proteins. Materials and Methods: Gas chromatography–mass spectrometry (GC-MS) analysis of the HF-CEE was performed. Methyl elaidate, the major compound identified, was molecularly docked with Bax and MDM2 (p53 inhibitor) using AutoDock 4.2. Drug suitability of methyl elaidate was determined by the rule of “5.” Results: Eleven different esters were identified in HF-CEE by GC-MS. Methyl elaidate was the major anticancer agent among the esters. Methyl elaidate bound with Bax and MDM2 at their active sites that can trigger apoptosis in cancer cells. Finally, methyl elaidate has potential drug properties according to the rule of “5.” Conclusion: Methyl elaidate of HF-CEE could be responsible for its anticancer activity and it is a potential apoptotic agent. Abbreviations used: HF-CEE: Hexane fraction of crude ethanolic extract of Moringa oleifera seeds; GC-MS: Gas chromatography mass spectrometry; MDM2: Mouse double minute 2 homolog. Context: Extracellular hydrogen ion concentration (pHo) is an important physiological regulator of vascular tone, maintained within 7.35–7.45 and any change in it leads to complex health problem including maintenance of normal blood pressure. Aims: This study aims to examine the altered function of Na+-K+ pump and inward rectifier potassium channels (Kir) channels in extracellular acidosis in goat superior mesenteric artery (GSMA). 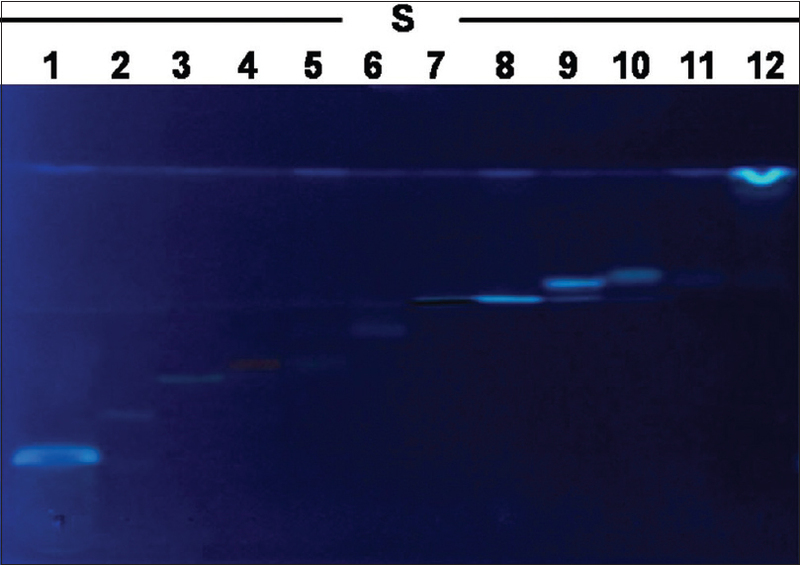 Subjects and Methods: Isolated GSMA rings were mounted in an automatic organ bath containing 20-ml modified Krebs–Henseleit solution at pH 7.4/6.8/6.0 and KCl-induced contraction was elicited either in the absence or presence of ouabain, barium (Ba2+), and combination of ouabain and Ba2+. Rings were dilated with potassium chloride either in the absence or presence of ouabain, Ba2+ and combination of ouabain and Ba2+ while maintaining at acidic pH. The responses were recorded isometrically by highly sensitive isometric force transducer connected to Powerlab and analyzed using LabChart 7.1.3 software. Statistical Analysis Used: Data were analyzed in GraphPad Prism 5 software. Results: K+ vasorelaxation response in K+-free solution precontracted rings the percent maximal response (93.57 ± 2.57%, 62.60 ± 3.56%, and 53.38 ± 5.41%) was decreased with decrease pHo (7.4, 6.8 and 6.0). Ouabain, Ba2+, and ouabain and Ba2+ inhibited the maximal vasorelaxation of potassium chloride (26.20 ± 3.48%, 17.39 ± 0.54%, 31.92 ± 1.10%) at pHo7.4, (42.74 ± 2.48%, 16.12 ± 3.49%, 22.32 ± 1.63%) at pHo6.8, and (53.87 ± 2.18%, 25.24 ± 2.90%, 39.71 ± 0.14%) at pHo6.0, respectively. Conclusions: Attenuated vasodilation in acidosis is due to reduced function or expression of ouabain-sensitive sodium–potassium ATPase (Na+-K+-ATPase) and Kir channels. In clinical acidosis, agents augmenting the activity of Na+-K+-ATPase and K+-Channel could improve hypertensive crisis. Abbreviations used: Ba2+: Barium; Emax: Percent maximal response; EBmax: Percent maximal response in presence of antagonist; KATP: Adenosine triphosphate-sensitive potassium channel; Kir: Inward rectifier potassium channels; KCa: Calcium-activated potassium channels; Na+-K+-ATPase: Sodium–potassium ATPase; NO: Nitric oxide; pHi: Intracellular hydrogen ion concentration; pHo: Extracellular hydrogen ion concentration; VSMCs: Vascular smooth muscle cells. Aim: The aim of this study is to investigate the induction studies of resistant starch (RS)-degrading enzyme purified from Lactobacillus fermentum. Background: RS is one of the components of dietary fiber and considered as a good prebiotic. Earlier studies from our laboratory reporting L. fermentum to be the most efficient in degrading RS among several lactic acid bacteria tested. L. fermentum produced α-glucosidase when grown on RS, which was purified biochemically and characterized. Results and Discussion: The alpha-glucosidase was synthesized de novo and was repressed by glucose. Known protein synthesis inhibitors such as potassium cyanide, 2,4-dinitrophenol, and tetracycline were found to inhibit α-glucosidase synthesis. Cyclic adenosine 3',5'-monophosphate was found to be a stimulator of α-glucosidase synthesis; however, it did not have any impact on the lag phase. Glutamate acted as an excellent nonrepressing carbon source. Maltooligosaccharides, dextrins, and soluble starch had varied influence on the induction of α-glucosidase synthesis. Conclusion: In the present communication, possible factors regulating α-glucosidase synthesis in L. fermentum were examined and discussed in terms of catabolite and apparent temperature-sensitive repression, culture age, induction, inhibitors, and various carbon sources. Abbreviation used: RS: Resistant starch. Background: Sugar-enriched diets/beverages consumption aggravates dysglycemia, dyslipidemia, insulin resistance, glucose intolerance, and weight gain. If unchecked, these disturbances culminate into diabetes. Indian medical classics advise consumption of roasted barley (BR) and roasted horse gram (HG) to resolve such issues. Objective: To investigate impact of BR and HG in chronic sucrose-induced dysglycemic rats. Materials and Methods: Dysglycemia was induced in rats by oral feeding of 40% sucrose solution continuously for 2 months. Later, rats were treated with test samples at a dose of 4 g/kg body weight twice a day for 1 month after withdrawal of sucrose feeding. Oral glucose tolerance test was performed at the end of experimental period. Biochemical and hematological parameters were analyzed accordingly. Nutritional contents and antioxidative stress activities in food grain powders were evaluated. Results: Chronic sucrose feeding induced glucose intolerance and weight gain. Mere sucrose withdrawal in the absence of supportive therapy aggravated glucose intolerance. Increase in plasma triglycerides, aspartate transaminase, and alanine transaminase and disturbances in hematological parameters were also observed. BR and HG treatment pacified sucrose-induced biochemical metabolic disturbances and improved hematological parameters. BR was superior in normalizing disturbances than horse gram. These grains possess potent antioxidant activities and antioxidative stress properties and are rich source of micronutrient vitamins, minerals, essential amino acids, and fatty acids. Conclusion: Consumption of these food grains may resolve and normalize sucrose-induced metabolic, biochemical, and hematological disturbances. Multiple therapeutic properties originating through phytochemicals, vitamins, minerals, amino acids, and fatty acids in totality may be responsible for observed beneficial effects. Abbreviations used: ABTS+: 2,2'-azinobis-(3-ethylbenzothiazoline -6- sulfonic acid) radical cation; AGEs: Advanced glycation end-products; ALT: Alanine aminotransferase; AST: Aspartate aminotransferase; BR: Roasted barley; CHO: Chinese hamster ovary cells; DCFDA: 2',7'-dichlorofluorescein diacetate; DPPH: 2,2-diphenyl-1-picrylhydrazyl; DMEM: Dulbecco's modified Eagle's medium; EDTA: Ethylenediaminetetraacetic acid; FeCl3: Ferric chloride; HEK: Human embryonic kidney cells; HG: Roasted horse gram; H2O2: Hydrogen peroxide; MTT: 3-(4,5-Dimethylthiazol-2-yl)-2,5-diphenyltetrazolium bromide; NBT: Nitro-blue tetrazolium; OGTT: Oral glucose tolerance test; SW: Sucrose-withdrawn rats; S60: Sixty-day sucrose-fed rats; TC: Plasma total cholesterol; TG: Plasma triglyceride; VC: Vehicle control normal rats. Background: Amnesia state damages the hippocampus and leads to the loss of short-term memory. Nyctanthes arbor-tristis (L.) is used in traditional medicines to treat various ailments. Objective: In the present investigation, we evaluated the efficacy of ethanolic extract of flowers of N. arbor-tristis against scopolamine-induced amnestic effect in male Wister rats and intended to identify the major compounds present in the extract. Materials and Methods: The anti-amnestic profile of flower extract was screened by elevated plus maze (EPM), passive avoidance (PA), and Morris water maze (MWM) tests. Results: EPM test confirmed the anxiolytic effect of the extract in rats and decreased the transfer latency in the protected arm of the EPM. During PA test, the extract resulted significant increase in step-down latencies during both the acquisition and retention sessions. In MWM task, the scopolamine injection significantly prolonged the escape latency time, whereas this time was shortened in flower extract-treated group. For the confirmation of anti-amnestic effect of extract, acetylcholine (Ach) content, acetylcholinesterase (AChE) activity, superoxide dismutase (SOD), reduced glutathione (GSH), and malondialdehyde (MDA) levels in hippocampus brain were evaluated. The extract significantly increased ACh content and decreased the activity of AChE in the hippocampus of the brain. Similarly, the extract declined the MDA and increased the GSH and SOD levels in brain tissues. The phytol (RT 19.69) and loliolide (RT 23.50) were identified in the extract through gas chromatography–mass spectrometry analysis. The four major compounds such as 4-coumaric acid, chlorogenic acid hemihydrate, chalcone, and melatonin were identified using ultra-performance liquid chromatography-quadrupole-time-of-flight mass spectrometry. Conclusion: The anti-amnestic effect of ethanolic extract of the flower was confirmed. It contains several compounds which might be useful in the treatment and to control several neurodegenerative diseases. Abbreviations used: ACh: Acetylcholine; AChE: Acetylcholinesterase; EPM: Elevated plus maze; MWM: Morris water maze; PA: Passive avoidance. Background: Alcoholism is the most common form of addiction and a worldwide problem. Alcohol addiction primarily leads to alcohol dependence and on abstinence leads to withdrawal effects. Common pharmacological properties of compounds used against alcohol addiction include anti-anxiety, anticonvulsant, antidepressant, and nootropic actions. valeriana wallichii known ethnopharmacologically for its sleep-inducing effects have all the above-pharmacological properties. Aim: Here, we screen valeriana for possible anti-addictive potential. 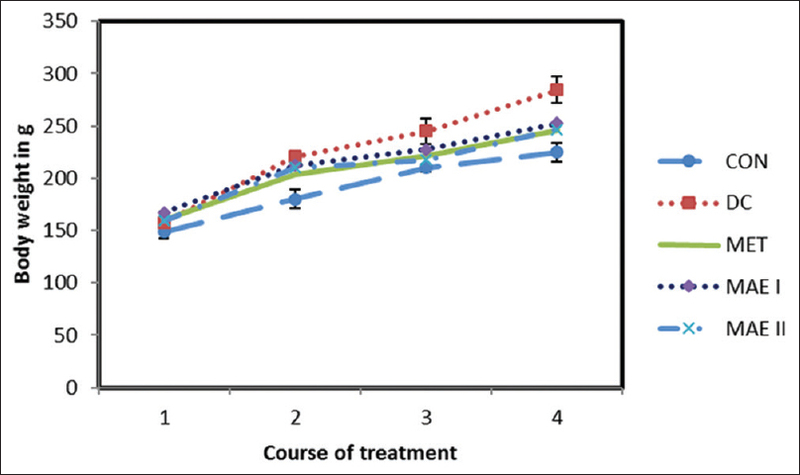 Materials and Methods: Effect of valeriana was measured on ethanol withdrawal anxiety using elevated plus maze. The role of valeriana on chronic ethanol consumption (21 days) was measured using two bottle choice method of voluntary drinking. We also measured the effect of the above herb on cortico-hippocampal gamma-aminobutyric acid (GABA) levels. 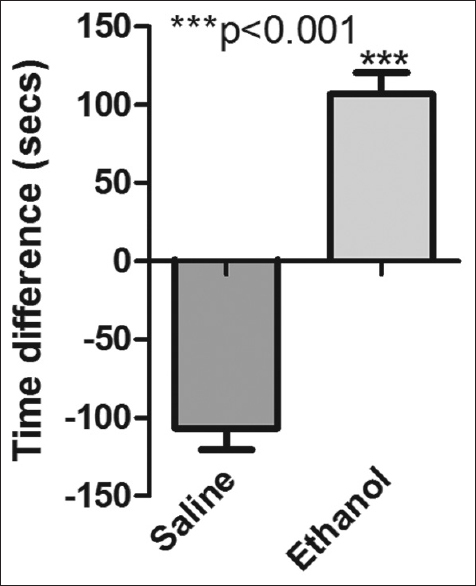 Results: Valeriana was found to reduce ethanol withdrawal anxiety in a dose-dependent manner. The herb also decreased ethanol intake and increased water intake significantly (P < 0.001) after 4 days of administration. Both these effects were potentiated (P < 0.001) by GABAA agonist zolpidem, and not affected by N-Methyl D-aspartic acid antagonist memantine, suggesting the role of GABAA receptor. Chronic administration of valeriana (10 days) also significantly (P < 0.01) increased cortico-hippocampal GABA levels in mice. Conclusion: Thus, valeriana reduced both ethanol dependence and withdrawal in a GABAA-dependent manner showing promising anti-addictive potential. Abbreviations Used: GABA: Gamma-aminobutyric acid; CNS: Central nervous system; CPP: Conditioned place preference; EPM: Elevated plus maze; NMDA: N-Methyl D-aspartic acid; HIV: Human Immunodeficiency virus. Background: The detailed study to overcome the limitations related to oral drug release and better encapsulation efficiency of the Saraca asoca extract has not been reported, despite having so many uses as sacred as well as a good medicinal plant. Objective: The aim of the present study was to fabricate a S. asoca extract-based chitosan microspheres conferring sustained released to enhance its medicinal use. Materials and Methods: A data mining online tool was used to check the interactions between the polymer used and formulation properties to analyze the relationships between them. The method uses a formulation of chitosan: polyethylene glycol (PEG) (2.1:0.9), drug (18.13%), sodium tripolyphosphate (6.55%), and crosslinking time (34.44 min) with a very good encapsulation efficiency and drug release. Results: The optimized formulation have showed an average particle size of 1157 nm, encapsulation efficiency of 73%, and drug release of 1052 mg GAE. In vitro release studies have shown a sustained release profile with maximum release till 24 h in pH 7.4 phosphate-buffered saline. The flowability of the optimized microparticles has shown a better Carr's index of 19.90 ± 0.21% and Hausner ratio of 1.24 ± 0.03. 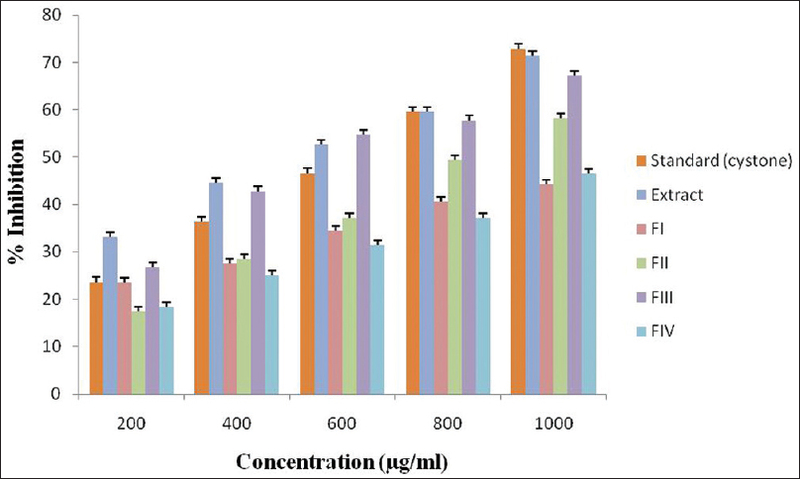 In vitro antioxidant activity of crude drug and microparticles has IC50 of 250.8 μg/mL and 188.2 μg/mL, respectively, showing an increase in the activity. 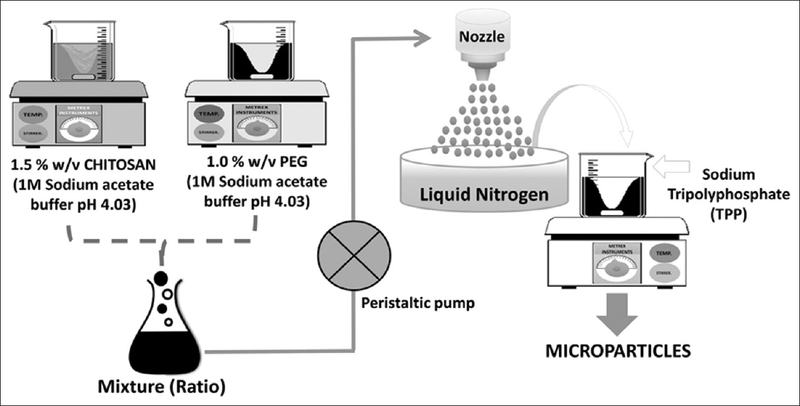 Conclusion: Chitosan-based S. asoca microspheres with enhanced encapsulation efficiency, in vitro drug release as well as improved in vitro antioxidant activity could be attained by chitosan-PEG coated microparticles. Abbreviations used: PEG: Poly ethylene glycol; TPP: Sodium tripolyphosphate; GAE: Gallic acid equivalent; DSC: Differential scanning calorimetry. Background: Alzheimer's disease (AD) is an irreversible neurodegenerative disease associated with memory loss and cognition deficit. At present, the drugs which are available in the markets only provide symptomatic relief to patients; there is no permanent cure for this disease. Several hypotheses have been proposed by various researchers, one of them is glutamatergic hypothesis which states the involvement of glutamate-mediated neurotoxicity in the pathogenesis of AD. The dysfunctional glutamine synthetase leads to overactivation of N-methyl-D-aspartate (NMDA) receptor resulting in neuronal injury and cell death. Objective: The present study was aimed to identify potential phytoconstituents as NMDA-receptor antagonist from conventionally used Indian spices for treating AD. Materials and Methods: In silico docking was performed to study the molecular interaction of different phytoconstituent from selected traditional spices such as clove, cumin, green cardamom, cinnamon, and black pepper, against NMDA receptor. ADMET descriptors were also determined for the top hit phytoconstituent. Results: Structure-based screening of 250 compounds from selected spices was performed on the basis of molecular docking. The top five leads were selected and further evaluated for ADMET properties. Caffeic acid was top lead based on the glide score, glide energy, and molecular interaction with NMDA receptor. Conclusion: The present study establishes different phytoconstituents as potential NMDA-receptor antagonist by in silico approach which can be useful in future as potential lead for the alleviation of symptoms associated with Alzheimer's disease. Abbreviations Used: AD: Alzheimer's Disease; NMDA: N-Methyl-D-Aspartate; ADMET: Absorption, Distribution, Metabolism, Excretion and Toxicity; CNS: Central Nervous System; Ca2+: Calcium ion; Amyloid Beta (Aβ); FDA: United States Food and Drug Administration; RCSB: Research Collaboratory for Structural Bioinformatics; PDB: Protein Data Bank; DCKA: 5,7-Dichlorokynurenic acid; NCBI: National Center for Biotechnology; Glide: Grid based Ligand Docking with Energetics; OPLS: Optimized Potentials for Liquid Simulations; BBB: Blood Brain Barrier; HIA: Intestinal Absorption; donorHB: Hydrogen bond donors; accptHB: Hydrogen bond acceptors; QPlogPo/w: Predicted octanol/water partition coefficient; RMSD: Root mean square deviation; Glu/NMDA: Glutamate binding site; Gly/NMDA: Glycine binding site; PC12: Pheochromocytoma cells of Rat adrenal medulla. Background: Acrylamide (AA), a product formed from fried foods, has been recognized as a genotoxic agent in animals and humans. Oxidative stress is considered as an indirect cause of AA-related genotoxicity. Objective: Resveratrol (RES) (trans-3,4′,5-trihydroxystilbene) is a natural polyphenol produced by plants such as grapes, berries, and peanuts. In the present work, we studied the potential positive effect of RES in preventing oxidative stress-related cytotoxicity and genotoxicity induced by AA in vitro using rat primary lymphocyte cells. Materials and Methods: The primary lymphocyte cells were induced with AA (5–500 mg/L) for toxicological evaluation and pretreated with RES (100 μM) to determine its protective effect on AA-induced toxicity. The reactive oxygen species (ROS), an inference of oxidative stress, the antioxidant enzyme activity of catalase (CAT), superoxide dismutase (SOD) and glutathione S-transferase (GST) were measured. In addition, the micronucleus (MN) and nuclear fragmentation were analyzed by confocal microscopy to study the protective role of RES on AA-induced genotoxicity. 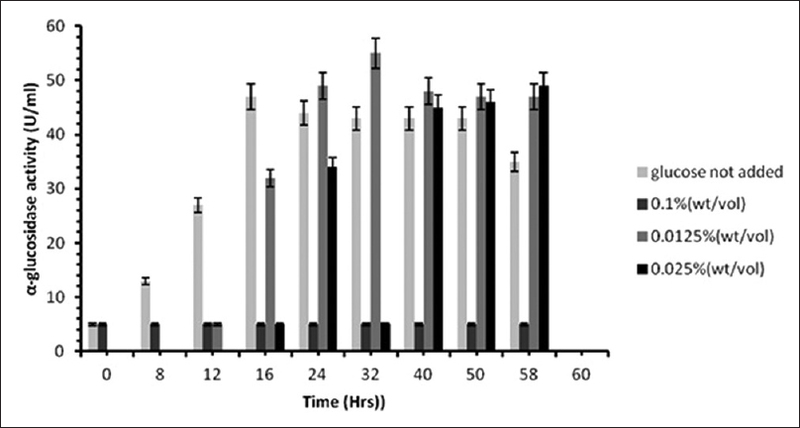 Results: The cells pretreated with RES at a concentration of 100 μM for 24 h protected against AA-induced cytotoxicity, caused a reduction in ROS, showed an elevation in the activity of CAT, SOD, and GST signifying an increase in antioxidant function. Furthermore, the genotoxic effects of DNA damage, MN and nuclear fragmentation induced by AA were reduced on RES preexposure, thus showing the protective effect. Conclusion: Thus, our results suggested that RES effectively protected primary lymphocytes from AA-induced genotoxicity probably through reduction of ROS and increased antioxidant function. Abbreviations Used: AA: Acrylamide; RES: Resveratrol; ROS: Reactive oxygen species; SOD: Superoxide dismutase; GST: Glutathione S-transferase; MN: Micronucleus; CAT: Catalase. Ethanopharmacological Relevance: Swietenia mahagoni (L.) Jacq. is a medicinal plant used in various medicinal practices for the treatment of various human ailments. Materials and Methods: The present study evaluates the antidiabetic potential of Swietenia mahagoni aueous extract (MAE) in fructose-induced diabetic rats with insulin resistance. MAE was analyzed using high-performance liquid chromatography (HPLC) and liquid chromatography mass spectrometry (LCMS) for the identification of constituent bio-actives present. Results: MAE treatment improved glucose levels, reduced the insulin resistance, improved glucose tolerance, improved pancreatic β-cell health, decreased glycated hemoglobin content, reduced lipid peroxides, and improved glycogen content and the activity of enzymes involved in the synthesis of glycogen in the liver. There was also overall improvement in the antioxidant status of the treated groups when compared with that of the diabetic control. The treatment also improved the lipid profile of diabetic rats. The HPLC analysis indicated the presence of gallic acid, scopoletin, coumarin, epicatechin, and ellagic acid, and their presence was confirmed by LCMS analysis. Conclusion: Results supported the antidiabetic potential of MAE in animal model where it can act on multitargets and ameliorate the overall diabetic condition rather targeting to control hyperglycemia. 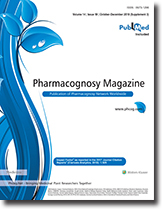 Thus, the study supports the scope of Swietenia mahagoni as an adjuvant in type 2 diabetic patients. Abbreviations used: ALT: Alanine transaminase; AST: Aspartate transaminase; ALP: Alkaline phosphatase; TBARS: Thiobarbituric acid-reactive substance; MET: Metformin; OGTT: Oral Glucose Tolerance Test; HOMA-IR: Homeostatic Model Assessment for Insulin Resistance; HOMA-β: Homeostatic Model Assessment for Beta-Cell Health; HPLC: High-performance liquid chromatography; LCMS: Liquid chromatography–mass spectrometry; M/Z: Mass/charge ratio; HbA1c: Hemoglobin A1c; CQS: Chloqine resistant; HIV: Human immunodeficiency virus; BW: Body weight. Background: Hyperthyroidism can be a serious health problem, if not treated properly. This investigation primarily aimed to evaluate the thyroid regulatory and hepatoprotective activities of ethyl acetate fraction (EPBL) of Piper betle leaf extract in L-thyroxine (L-T4)-induced hyperthyroid rats. Materials and Methods: Effects of EPBL extract at a prestandardized dose of 50 mg/kg (p. o.) were studied in L-T4 (500 μg/kg/d, i. p.)-administered rats to examine the alterations in the levels of serum triiodothyronine (T3), thyroxine (T4), thyrotropin, alanine transaminase, and aspartate aminotransferase; in the activities of hepatic 5'-monodeiodinase (5'DI), glucose-6-phosphatase (G-6-Pase), and Na+-K+-ATPase; in the level of tissue malondialdehyde (MDA) and lipid hydroperoxides (LOOHs); and in the activities of antioxidants. Results: Administration of the EPBL extract reversed the T4-induced increase in serum thyroid hormones, the liver marker enzymes, MDA, and LOOH but enhanced the activities of antioxidative enzymes and reduced the glutathione content. Light microscopic findings of liver histology revealed distorted hepatic tissue architecture in hyperthyroid animals that were improved by the EPBL administration. High-resolution liquid chromatography–mass spectroscopy analysis revealed four main flavonoid glycosides such as quercetin, rutin, kaempferol, and luteolin. Conclusion: For the first time, our findings revealed the antithyroidic property of EPBL in T4-induced hyperthyroidism, without any hepatotoxicity. The antithyroidic and antioxidative properties of EPBL in hyperthyroid animals could be due to the presence of flavonoid glycosides in the extract which might have inhibited the thyroid hormone secretion and conversion of T4 to T3 through an inhibition of 5'DI. Abbreviations used: EPBL: Ethyl acetate Piper betel; HR-LC-MS: High-resolution liquid chromatography–mass spectroscopy; T3: Triiodothyronine; T4:Thyroxine; TSH: Thyrotropin; PTU: Propylthiouracil; ALT: Alanine transaminase; AST: Aspartate aminotransferase; DTT: Dithiothreitol; G-6-Pase: Glucose-6-phosphatase; Na+-K+-ATPase: Sodium-potassium adenosine triphosphatase; 5'DI: 5'-monodeiodinase; MDA: Malondialdehyde; LOOHs: Lipid hydroperoxides; SOD: Superoxide dismutase; CAT: Catalase; GSH: Reduced glutathione; GPx: Glutathione peroxidase; CPCSEA: Committee for the Purpose of Control and Supervision of Experiments on Animals. Introduction: Caryota urens belongs to the palm family and is widely distributed in Asia. Conventionally, it is used to treat gastric ulcers, snake bites, migraine, and rheumatic swellings. The objectives of this study were to determine the phytochemical content and antioxidant activities of hydroalcoholic and aqueous (Aq) extracts of various parts of C. urens. Materials and Methods: Extractions of various parts of C. urens were performed by cold maceration using different solvents such as 70% ethanol and distilled water. The extracts were subjected to assessment of their antioxidant potential using various in vitro systems such as 1,1-diphenyl-2-picrylhydrazyl radical, hydroxyl radical, superoxide radical, lipid peroxidation, and phosphomolybdenum reduction. The extract was subjected to Fourier-transform infrared spectroscopy, liquid chromatography–mass spectrometry (LC-MS), and high-performance liquid chromatography (HPLC) analysis to detect the phytoconstituents. 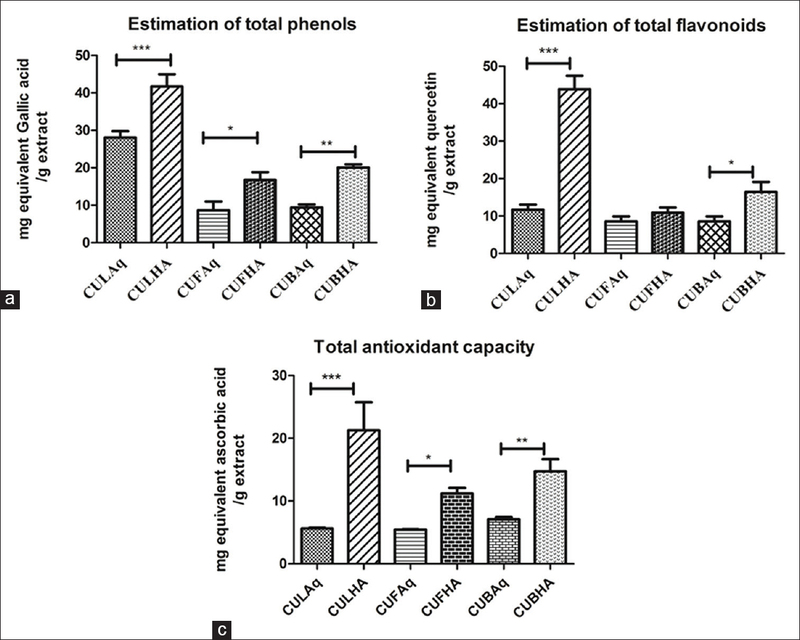 Results: The total flavonoid and total phenol content was found to be highest in leaf hydroalcoholic extract (C. urens leaf hydroalcoholic extract [CULHA]), 43.84 ± 3.59 mg/g quercetin equivalent, and 41.68 ± 3.30 mg/g gallic acid equivalent, respectively. Hydroalcoholic extracts of C. urens (CULHA, C. urens fruit hydroalcoholic extract and C. urens bark hydroalcoholic extract) had the highest antioxidant activity when compared to Aq extracts. Phenolic acids, coumarins, carboxylic acids, and flavonoids were characterized by LC-MS. HPLC analysis further confirmed the presence of rutin, umbelliferone, and ferulic acid. Conclusion: A direct association between the high content of flavonoid rutin and antioxidant activity in leaf hydroalcoholic extract was noted. The fact that C. urens is rich in coumarins and rutin seems to explain the high antioxidant potential of this plant extract. Abbreviations Used: DPPH: 1,1-diphenyl-2-picrylhydrazyl; LPO: Lipid peroxidation; SO: Superoxide; NBT: Nitroblue tetrazolium; PMS: Phenazine methosulfate; CULHA: C. urens leaf hydroalcoholic extract; CULAq: C. urens leaf aqueous extract; CUFHA: C. urens fruit hydroalcoholic extract; CUFAq: C. urens fruit aqueous extract; CUBHA: C. urens bark hydroalcoholic extract; CUBAq: C. urens bark aqueous extract; ROS: Reactive oxygen species; %: Percent; °C: Celsius; μg: Microgram; μl: Microliter; mg: Milligram; ml: Milliliter; OD: Optical density; IC50: Concentration yielding 50% inhibition; FTIR: Fourier-transform infrared spectroscopy; LC-MS: Liquid chromatography–mass spectrometry; GAE: Gallic acid equivalent; QE: Quercetin equivalent; AE: Ascorbic acid equivalent; TPC: Total phenolic content; TFC: Total flavonoid content; TAC: Total antioxidant activity. Background: Zanthoxylum alatum (ZA) is used ethnomedicinally for the treatment of various diseases. It is used as a nerve tonic in weak patients and in vertigo. 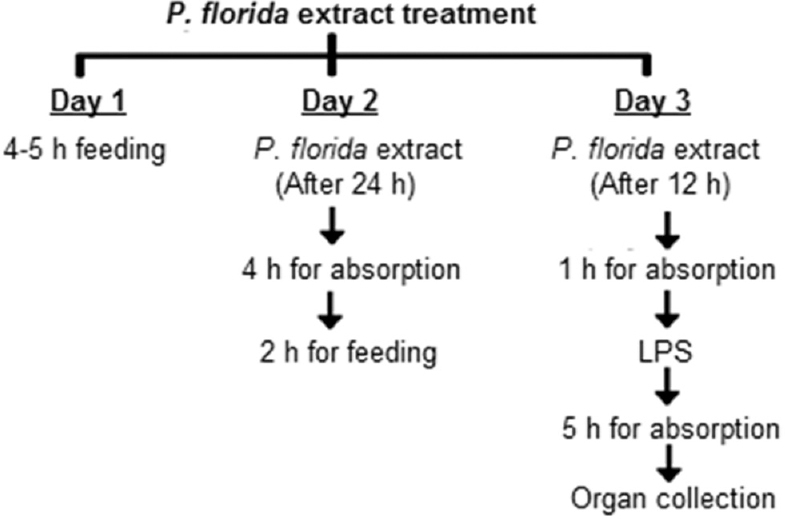 Objective: The beneficial effect of hydroethanolic extract of ZA seeds (HEZA) on lipopolysaccharide (LPS)-induced depression-like behavior in mice was studied with its possible underlying mechanisms. Materials and Methods: HEZA (100 and 200 mg/kg, p.o.) and imipramine (10 mg/kg, i.p) were administered for 14 consecutive days, followed by LPS (0.83 mg/kg i.p) injection, 30 min posttreatment. Behavioral studies including the open field test, forced swimming test, tail suspension test and sucrose preference test were performed after 24 h of LPS administration. Levels of pro-oxidant markers (Lipid peroxidation (LPO), Nitric oxide (NO) and antioxidant enzyme viz. Glutathione (GSH), Superoxide dismutase (SOD), Catalase (CAT), Glutathione peroxidase (GPx) were estimated biochemically; Norepinephrine (NE), Dopamine (DA) and 5-hydroxytryptamine (5-HT) levels by high-performance liquid chromatography; nuclear factor- κB (NFκB), nuclear factor (erythroid-derived 2)-like 2 (Nrf2) and caspase-3 mRNA expression using reverse transcription-polymerase chain reaction; the proteins of brain-derived neurotrophic factor (BDNF) and tropomyosin receptor kinase B (TrkB), in hippocampal tissue were evaluated by Western blot. 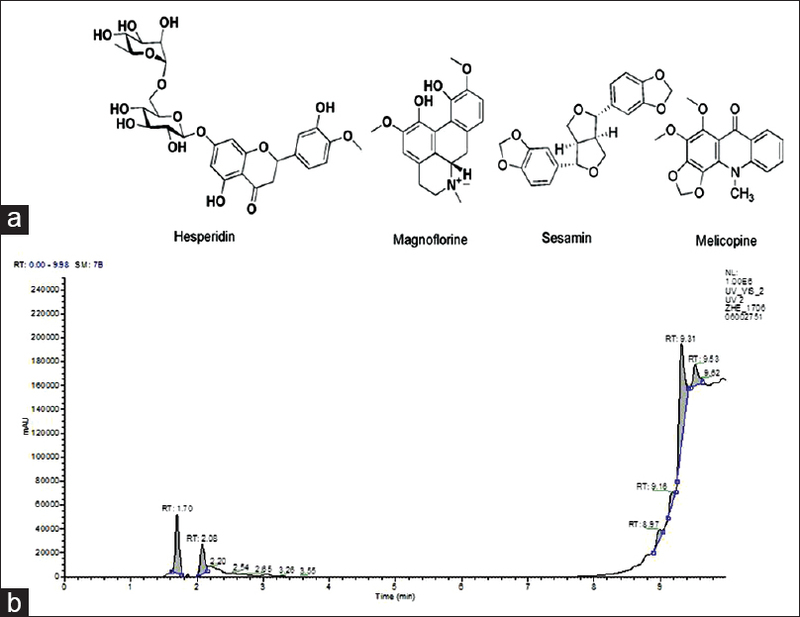 Hesperidin, magnoflorine, melicopine, and sesamin were few phytoconstituents identified by liquid chromatography–electrospray ionization–tandem mass spectrometry studies. Results: Administration of LPS produced significant depression-like behavior by reducing the locomotor activity in open field test, increasing the immobility time in forced swim test and tail suspension test, increased LPO, NO, decreased GSH, SOD, CAT, GPx levels; lowered NE, DA and 5-HT level, upregulated NFκB, Nrf2 and Caspase-3 mRNA expression and downregulated BDNF, TrKB protein expression. Pretreatment with imipramine and HEZA reversed LPS-induced behavioral patterns, inhibited oxido-nitrosative stress, elevated antioxidant enzyme levels, and normalized the NE, DA, and 5-HT levels. The treatment also suppressed the mRNA expression of NFκB, Nrf2, and Caspase-3 gene with upregulation of BDNF protein expression, the molecular marker for depression. Conclusion: Antidepressant-like activity of HEZA is assumed to be mediated by antioxidant property, impending neuroinflammation, alteration of monoaminergic responses, and preventing BDNF depletion. Abbreviations used: HEZA: Hydroethanolic extract of Zanthoxylum alatum seeds; LPS: Lipopolysaccharide; OFT: Open field test; FST: Forced swim test; TST: Tail suspension test; SPT: Sucrose preference test; LPO: Lipid peroxidation; NO: Nitric oxide; GSH: Glutathione; SOD: Superoxide dismutase; CAT: Catalase; GPx: Glutathione peroxidase; HPLC: High-performance liquid chromatography; NFκB: Nuclear factor-κB; Nrf2: Nuclear factor (erythroid-derived 2)-like 2; RT-PCR: Reverse transcription-polymerase chain reaction; BDNF: Brain-derived neurotrophic factor; TrkB: Tropomyosin receptor kinase B; 5-HT: 5-hydroxytryptamine; NE: Norepinephrine; DA: Dopamine; PCA: Perchloric acid; LC-ESI-MS/MS: Liquid chromatography–electrospray ionization–tandem mass spectrometry; ZA: Zanthoxylum alatum.